The President of UEAN (about 8,000 students), Herbert Perico, and members of their Business School look to Presidio Graduate School as the best model in North America for how to teach sustainable management in an MBA/MPA Program. They want to become the leaders in South America, spreading the PGS model through the region. 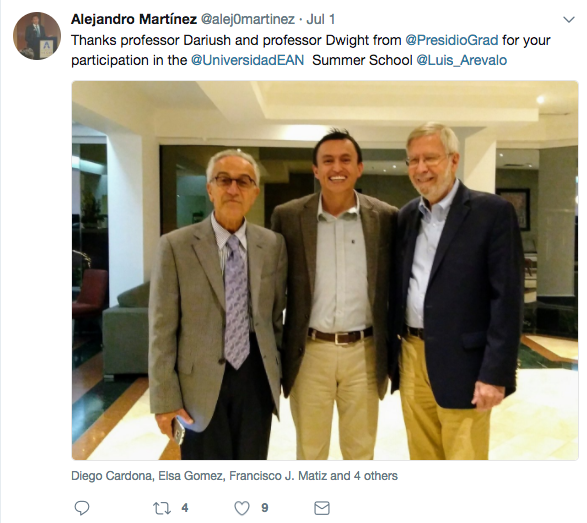 Below is an open letter from Provost Dariush Rafinejad about this summer's academic collaboration between Presidio Graduate School and Universidad EAN of Bogota, Columbia. Students from Universidad EAN kick off the partnership between the two schools in the Presidio Graduate School offices. I am writing to inform you about my recent visit with Dwight Collins to the EAN University in Bogota, Colombia. In December 2016, PGS signed a Memorandum of Understanding (MOU) with Universidad EAN of Bogota, Colombia for academic collaboration in sustainable management. EAN is a private university with 8,000 students. It has undergraduate and graduate programs in business, engineering, and humanities, with a prestigious Institute in Sustainable Entrepreneurship offering sustainable entrepreneurship courses in the other programs. The PGS dialog to date has been with leaders of this Institute. The MOU stipulates specific agreements for each subsequent collaborative effort between UEAN and PGS. The first specific agreement for the Summer 2017 Program in Bogota was signed by both parties in May 2017. EAN University agreed to pay all expenses for Dwight and me to travel to Bogota and teach one week of a two week Summer Program in Sustainability in Strategic Management. Our classes were very well received by the students. We also had several productive meetings with the EAN faculty, deans, and students. 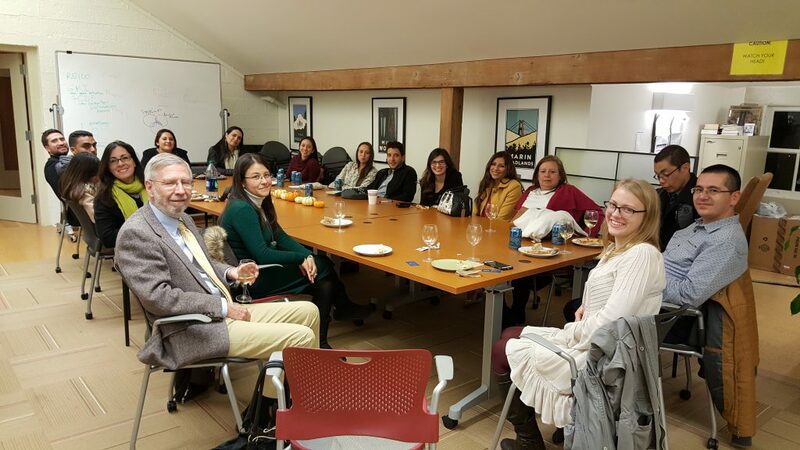 A number of these meetings surfaced the potential for future joint initiatives around teaching PGS-based curricula and offering PGS Experiential Learning opportunities in both Colombia and US to students enrolled in both our academic programs. "International teachers highlight the sustainable entrepreneurship offering of U. EAN"
"Following the formalization of an international alliance between EAN University and the Presidio Graduate School (PGS) in San Francisco, USA, a course in "Sustainability in Strategic Management" taught by teachers attached to PGS was held at UEAN from June 20 to July 1. The course was sponsored by UEAN’s Institute for Sustainable Entrepreneurship and taught by Professors Dwight Collins and Dariush Rafinejad of PGS; which is a pioneer institution in postgraduate programs in Sustainable Management in the US. The international guests expressed their admiration to EAN University for its commitment to sustainability and entrepreneurship, two dimensions that according to Dr. Dariush Rafinejad "are really critical to the future not only of the country but of the world." As respected proponents of sustainable entrepreneurship, Drs. Rafinejad and Collins expressed how impressed they have been with the research initiatives and the educational model managed by our Institution toward the formation of the next generation of entrepreneurs for the benefit of society. During the meeting, Dr. Collins’ excitement over the potential achievements of our cooperative work was evidenced, as he commented on what a wonderful experience it will be for the two institutions, their students, and their faculties to develop new projects together. Finally, for Dr. Rafinejad, the challenge of EAN University is to grow its unique capabilities for offering all the knowledge that leaders need to make the transition from past practices to a sustainable world."